Everyone knows LeVar Burton, right? 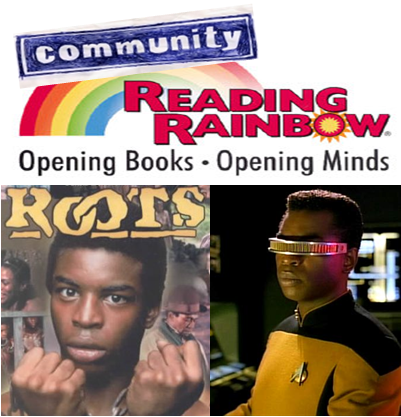 He was the host and producer of one of my beloved childhood shows Reading Rainbow. That’s good enough for me, but he was also Lieutenant Commander Geordi La Forge on Star Trek: The Next Generation (aka the guy with the cool Cyclops-from-the-X-Men-like sunglasses) and Kunta Kinte from the acclaimed miniseries Roots. Burton will be guest starring on NBC’s Community tonight. Even without Burton, this show should be a must watch for everyone. It’s very funny, and loaded with talent (i.e. Chevy Chase, Donald Glover). The whole Thursday night lineup for NBC is awesome, so, unless you have someplace to be, you should spend the whole evening watch great comedy. Community begins at 8pm, followed by Perfect Couples (haven’t seen enough episodes to form an opinion yet, but so far so good), my favorite The Office, Parks & Recreation, 30 Rock, and Outsourced (haven’t bothered to watch this show, not sure if it’s good). Once FX has new episodes of It’s Alway’s Sunny in Philadelphia and The League to add to Archer, it will be tough to get me off the couch on Thursdays. Just woke up after a great night at the O’Dome watching the Gators beat Kentucky. One thing I love about college sports is that many teams pick a song and make it their own. Songs like “Kernkraft 400”, “Jump Around”, “Sandstorm”, or anything by 2Unlimited are great, and I love them, but because of their popularity they are overplayed and are heard pretty much everywhere. I enjoy lesser known songs becoming traditions. An example in the US is “Chelsea Dagger” by the Fratellis. Yes, it is a pretty well known song, but it does not have the universally recognized status that other songs such as Seven Nation Army might have. Many soccer teams in England use it to celebrate goals, and the song has also been featured in many popular movies, too. Even so, if you played it walking down the street in any city in the US – except for maybe Chicago – most people would not know what song they were hearing. This is why I loved when I heard the student section at Northwestern jump around and sing this song in the final minutes of their near-upset win against top ranked Ohio State. I assuming it’s a Chicago thing, as its the Blackhawks goal song. Not as much excitement in the pro game as in college, in my opinion, but still fun, and still a great crowd song – especially in the college setting. Now back to the Gators. We play a song called “You Can Call Me Al” by Paul Simon. Admittedly, besides Gator games, I probably knew this song better from The Office than from Paul Simon. Still, there’s nothing like having that song as part of Gator DNA. The energy we put into playing and singing that song is just amazing. Yes, “Kernkraft 400” and others pump up the crowd too, but, especially with the integrated Gator Chomps, we can call “You Can Call Me Al” our own. It really does make it that much better. Especially when we win four minutes later!